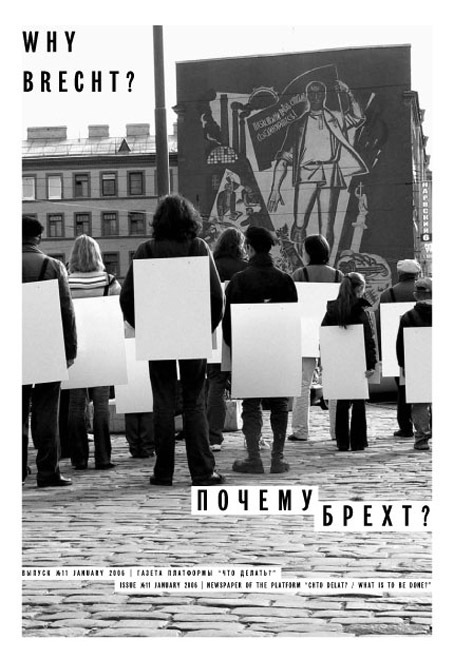 Home » Newspapers » #11: Why Brecht? The site of this visualization would be Stachek Square, from where the striking workers of 1905 marched on the Winter Palace (stachka means “strike” in Russian). We decided to bring Brecht’s poem out into this urban space line for line, carried by “engaged” sandwich people. Bertold Brecht’s body of work was a such an important point of reference because it contains such a broad variety of aesthetic methods to answer the call of the concrete historical situation. In Brecht’s work, there is a clear understanding of how dialectical mechanisms are always at work in creativity, describing reality as a process of constant change that arises as a result of the conflicts and contradictions that makes the transformation of society possible. In our piece, we tried to imagine how this dialectic might work today. Silently coagulating and reconfiguring their body-signs to the soundtrack of passing cars, these sandwich people demonstrate the potential of new representational constellations between protesting singularities from a broad variety of backgrounds and age groups pensioners, activists, children thrown into a dialectic of constant change. But at the end of our piece, we asked our participants to read Brecht’s poem out loud. The effect is very strange, and might be described with what Brecht called the alienation effect: the silent motility of political potential erupts into decisive poetic speech, distancing the spectator from the action’s reconfigurative flow. Recited in a “Soviet” mode, the poem now resounds with the depleted pathos of the revolutionary past, a re-collection (Er-innerung) of the very language that new forms of protest aspire to negate. Dmitry Vilensky /// Why Brecht? I laugh when they weep, I weep when they laugh. If we try replacing the word “opera” with culture or art in Brecht’s text “OPERA – WITH INNOVATIONS!”, it paradoxically becomes clear that Brecht’s analysis of the situation more than 70 years ago is more than relevant today. Of course, many things have changed, such as the notions of power, class, labor, the means of struggle. But still, anyone who is still capable of considering the necessity of connecting thought and action now hits upon the same problem that was so obvious then: how is it possible to take intellectual action within the alienating system of capital, an action that might force society’s radical change? Arguing with Adorno, we continue to ask “how the right is possible in the wrong”*, that is, how to gain a clear historical consciousness of the moment, and how it is possible to act correspondingly. Bertold Brecht /// Opera – with Innovations! For some time past there has been a move to renovate the opera. Opera is to have its form modernized and its content brought up to date, but without its culinary character being changed. Since it is precisely for its backwardness that the opera-going public adores opera, an influx of new types of listener with new appetites has to be reckoned with; and so it is. The intention is to democratize but not to alter democracy’s character, which consists in giving the people new rights, but no chance to appreciate them. Ultimately it is all the same to the waiter whom he serves, so long as he serves the food. Thus the avant-garde are demanding or supporting innovations which are supposedly going to lead to a renovation of opera; but nobody demands a fundamental discussion of opera (i.e. of its function), and probably such a discussion would not find much support. Janna Holmstedt /// Are You Willing to Get Stupid? Six basic questions in the Media and Communication Science are: Who is speaking? To whom? About what? With what means? In which situation? And what is the effect? They are used to analyze different forms of communcation. According to a classical model, information is coded and then transfered from a sender via a channel to a receiver where the message is decoded. Noise and interference should be eliminated to secure a successfull transfer of information. A rhetorician using this model thus structures his speech according to the message he wants to deliver in order to be as efficient as possible. It is important to catch the audiences attention and to be understood (Do I make myself clear?). Is this mass media logic possible to apply to any form of human communication, as art for example or a conversation between friends? A rhetorician I spoke to said yes. I say no. We often speak without having a specific message to deliver, because the act of speaking activates experiences that are not easily captured. Rather than being spoken about, they reveal themselves as a movement between, as drift. Unlike the aforementioned rhetorician with his goal set on being understood clearly, I believe that communication begins when we do not understand. Karaoke is the good clean fun for the millennial nuclear family … Here in “Cool Britannia” where I live, everyone is a celebrity because the nation (whatever it is) is such a star that everyone who lives in it by implication is a star as well. The wind of history turns the pages of burnt-out books, flipping them open at the most appropriate place. Today, this place is Brecht. Why exactly Brecht? Because Brecht, without being a professional philosopher, exposed the logic of capitalisms escalation into fascism with sober clarity and sarcasm, and because this exposition still retains its heuristic strength? Yes, but not only. Because his critique of the bourgeois means of cultural production from within (the exposition of exposition) could not be any more current than here and now? That is certainly so. Because in developing his method, he combined critical theory with revolutionary praxis, becoming a founder of socialist art, along with Mayakovsky, Filonov, or Eisenstein? Oh, quite! Because his dynamic  and analytical  version of socialist realism (and socialist pedagogy) differs favorably from the official dogmata? Not exactly incorrect. Because, hand in hand with the newest scientific discoveries of his time, he gave the theater new meaning as a mode of cognition, and not emotional impact, paving the way for a semiology of the theater (his theater is neither pathetic nor rational but well-founded. (Barthes))? It goes without saying. But also because he decisively connected the material form of the drama with a definite  Marxist  idea, revealing a model of politicized art (which Benjamin called for and oriented himself toward) that was, however, still art? This is probably what is most important. And the most difficult, if one wants to draw upon this (artistic) experience in practice. Because in the final analysis, and this is something we need to admit, the theatrical technique that Brecht developed aimed at interrupting (the illusion of) art. This interruption is epochal. Though it can hardly be reduced to the end of art declared by Hegel, it can be related to this idea nevertheless on one fundamental point, namely in that it effects an epoch? of sorts, a gesture in which the dialectic (of our epoch) comes to a standstill and freezes up in inaction. In things, people, and events there is something that makes them the way they are, and at the same time, there is something that makes them other. This is how Brecht formulates his principle of hope connected with the conviction that life is inseparable from becoming, and that its recognition does not amount to affirmation but to change. It is this dialectic accent that lies at the base of the epic theater, founded upon the alienation effect and the critical revision of the Aristotelean notion of mimesis. The goal of art is not just to depict things, people, and events themselves, but also to reveal this something that makes them other than themselves. If one understands mimesis as the imitation of what exists, then art is not mimetic. The only thing that is mimetic is the death mask, taken from the dead artists frozen face. Art, on the other hand, and dramatic art in particular, are historical and dialectical. It is only mimetic in the facial expressions and gestures of the actor, which amount to what Brecht called the social gestus, the dynamic expression of social relationships that exist within a definite historical epoch. David Riff /// An Apology of the Obvious? Read through the lens of fatigue, the question “Why Brecht?” seems to preface an apology of the obvious. Though the Brechtian aesthetic is an inalienable part of modernity’s cultural legacy, its political significance has yet to be recaptured. So much is clear. The Brechtian aureole – women in kerchiefs, men in worker’s caps, hurdgy-gurdy organ music, stark lighting, sparse props, proximal action played out in the ramp lights – has become a stylistic resource for contemporary culture. The Brechtian method has been disassembled into an array of generic components for the toolkit of knowledge production. Brecht is both everywhere and nowhere, leading to a strange mixture of nostalgia and “Brecht fatigue.” Brecht may be inalienable but where is Brecht the political artist, the practical philosopher, the Marxist? Not why Brecht, but which Brecht, wither Brecht? Esa Kirkkopelto – Artiom Magun /// Brecht. Earth. Helsinki. December. Coffee. Cigarettes. Kirkkopelto. Magun. Driven by the compulsion, to repeat, two non-compromising avant-gardists, Esa Kirkkopelto (Finnish philosopher, playwright, and theatre director) and Artiom Magun (Russian philosopher), went to drink their afternoon coffee at the railway station of Helsinki – the flamboyant monument of modernist national-romantic architecture where Brecht wrote his “exile dialogues” in 1940. There, they had the following discussion. Artiom: One of the problems I have with Brecht, is the seemingly unique status of this figure. Because he provided a way to combine avant-garde art (destruction of form and exposition of the technique) with direct political engagement that still makes sense today -even though his concrete political statements may have become obsolete. And as for other similar type of avant-gardism – like Marinetti’s futurism, and even the “futurism” of Mayakovsky – they seem to be suspect now, since they either tend toward self-sufficient fascist hysteria, or toward autonomous, elitist art.